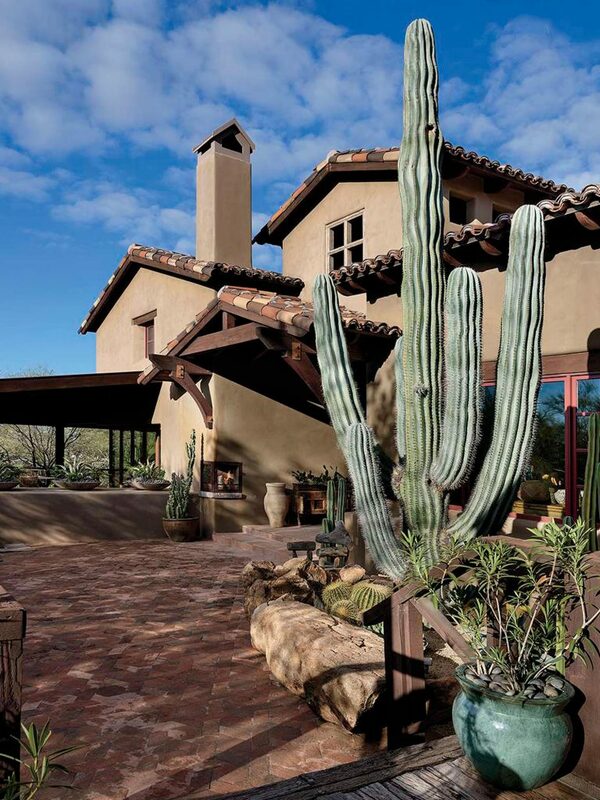 “Carlos the Cardon”presides over the front entrance courtyard of the lodge-inspired home of Taunya and Steve Davis. 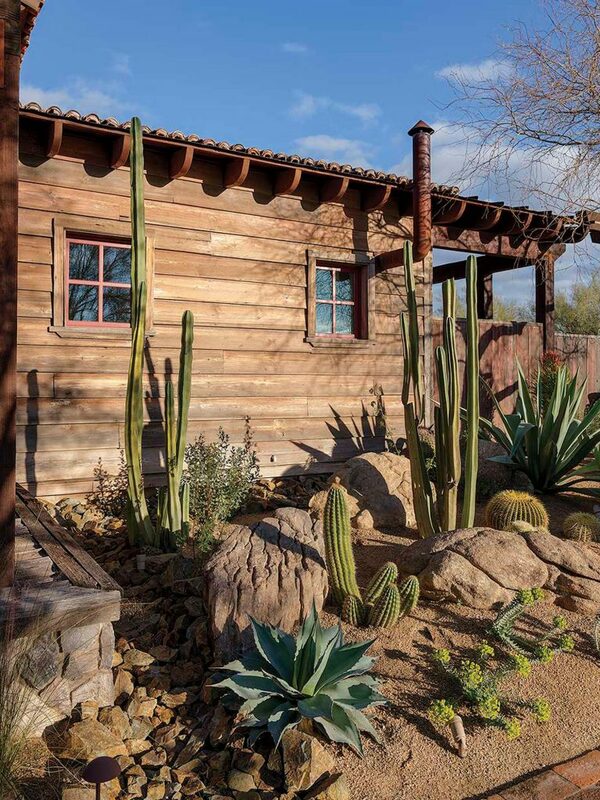 Its boulder-lined plant bed also includes Mexican fence post and golden barrel cacti, Moroccan mound, yucca and agave. Carlos makes a bold statement without crowding the area or blocking natural light from entering through the large picture window. 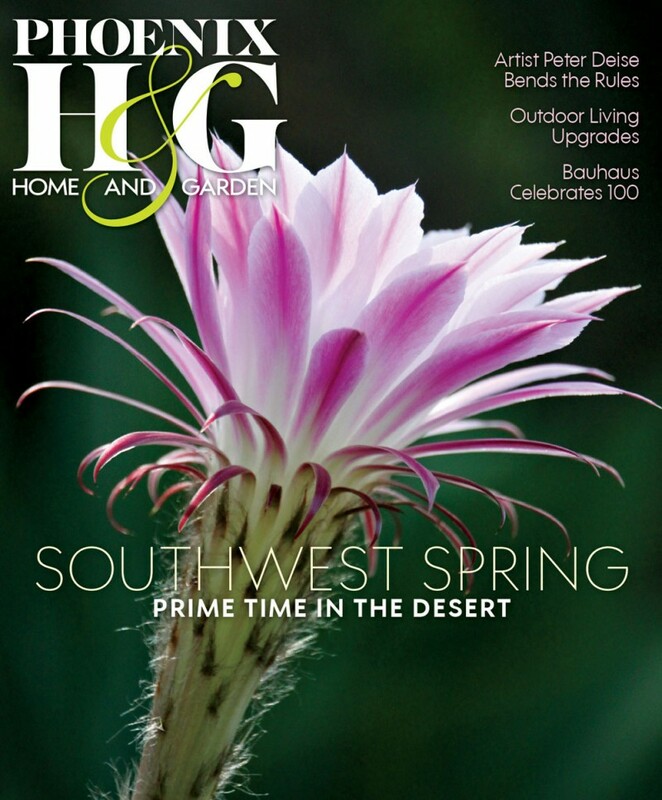 A dramatic desert landscape rustles up qualities of the Old West. 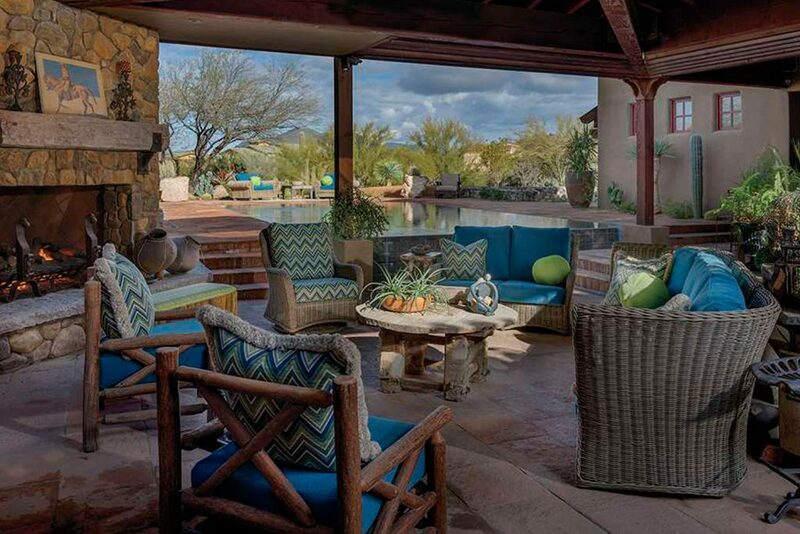 In the exclusive North Scottsdale enclave of Whisper Rock, where Spanish colonial estates and Old World-influenced villas dot the terrain, the decidedly Western-style residence of Taunya and Steve Davis offers a fresh spin on Old Arizona. 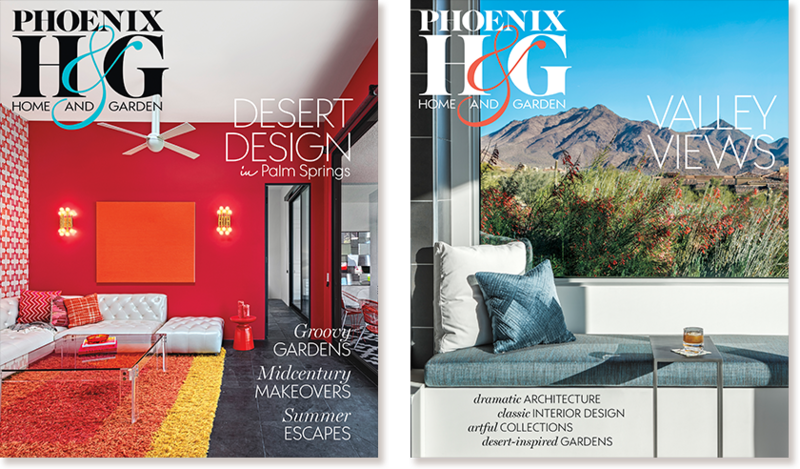 The comfortable vibe of the house is matched only by its eye-catching landscape filled with mature desert-friendly specimens. The verdant gardens conjure a welcoming atmosphere that would lasso any cowboy’s heart. “From the moment we first saw the home, we knew there was something interesting about it,” says Taunya. “It called to us, and we fell in love with it. 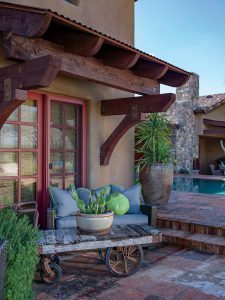 I couldn’t wait to work on the yard because I knew it could be fantastic.” To give the grounds a look that appears as though it’s been there since the days of the Wild West, the couple turned to Phoenix Home & Garden Masters of the Southwest award-winning landscape designer Chad Norris. 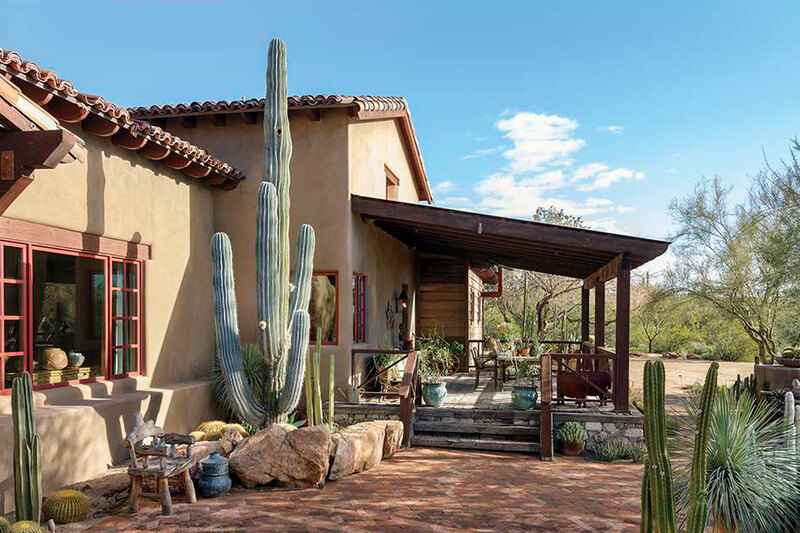 The rustic contemporary character of the Western ranch-style house, designed by architect Bob Bacon, is gradually revealed, thanks to an intricately layered palette of cacti, agaves and boulders designed to guide the eye up the long entry drive and to the front porch. Weathered shiplap and stone accent the stucco exterior, which features a rusty stovepipe and a metal-roofed front porch fashioned from reclaimed barn wood. A ranch gate, crafted of thick beams, leads to a motor court. It wasn’t always that way. When the Davises purchased the property, the landscape was an overgrown tangle of creosote and scrub. 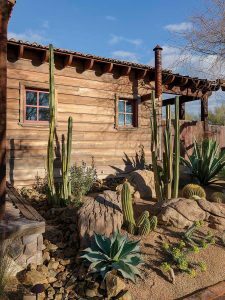 Norris trimmed and shaped every inch, removing neglected and dead foliage, revealing natural-growth hedgehog and barrel cacti and red-blooming chuparosa, and highlighting the more than 50 trees that surround the home. Norris enhanced the native plantings by adding moundings of land throughout the property and importing approximately 80 tons of boulders. “They appear as though they were born here or just rolled in during the ice age,” says Taunya. “The use of the boulders was one of the biggest surprises of the design, and they have made a huge impact.” In the front yard, the designer employed chunky riprap to underscore a natural wash, adding a serpentine line of rugged texture that meanders through the grounds. 1. The sun-dappled front porch is a favorite spot of the Davises for enjoying a morning coffee or afternoon siesta. A painted sculpture of a wooden soldier keeps watch over a pot of bright pink cyclamen, while a wooden wheelbarrow-style cart bursting with cow horn agave (Euphorbia grandicornis) adds to the setting’s charm. 2. 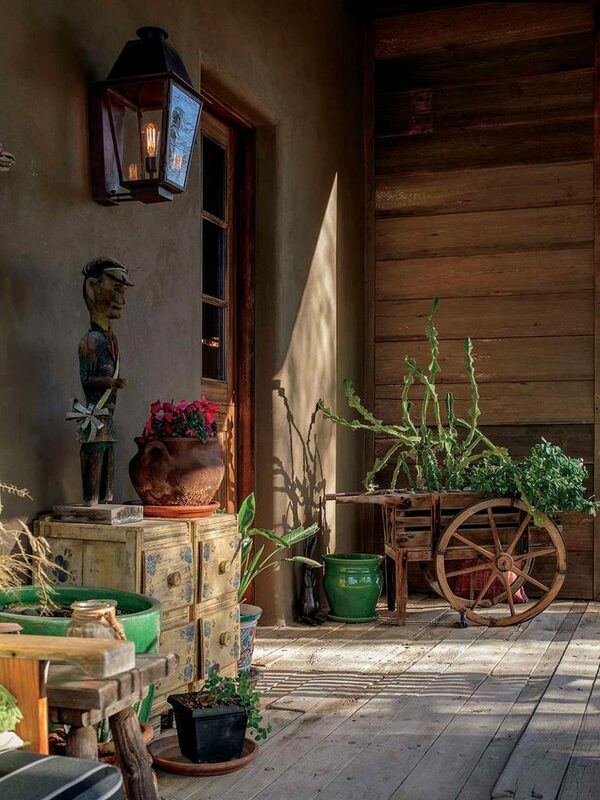 Shiplap wallcovering and a rusty stovepipe evoke images of the Old West and serve as a backdrop for a plant vignette that features towering Mexican fence post cacti, mature whale’s tongue agave (Agave ovatifolia), golden barrels, a young Argentine giant, Texas sage and blue hibiscus. Yellow-blooming silver spurge (Euphorbia ridiga) form the front layer of color and texture. Taunya enjoys the newly landscaped front yard from the covered porch, which she says is her favorite spot to sit and relax. “I like to take an afternoon nap out here with the dogs,” she notes. “It’s just a nice place to hang out. We have a squirrel who lives beneath the porch, and we’ve named him Sir Henry.” A mother bobcat and her three babies, who the Davises have dubbed Huey, Dewey and Louie, also frequent the property. “That deck is so unusual,” says Norris. “I don’t think I’ve seen anything like it in Scottsdale. 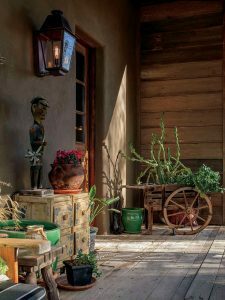 Elevated and made of weathered wood—it totally accentuates the home’s style.” The deck is furnished with a farmhouse table, rocking chairs, a comfy couch and a pair of decorative rusted steel llamas. “I wanted to give prominence to the deck and not take away from it,” Norris adds. The designer removed a formal hedge that encircled the wood structure and replaced it with wispy grasses and low plantings that bloom throughout the year, including pink muhly grass and lilyturf (Liriope muscari). 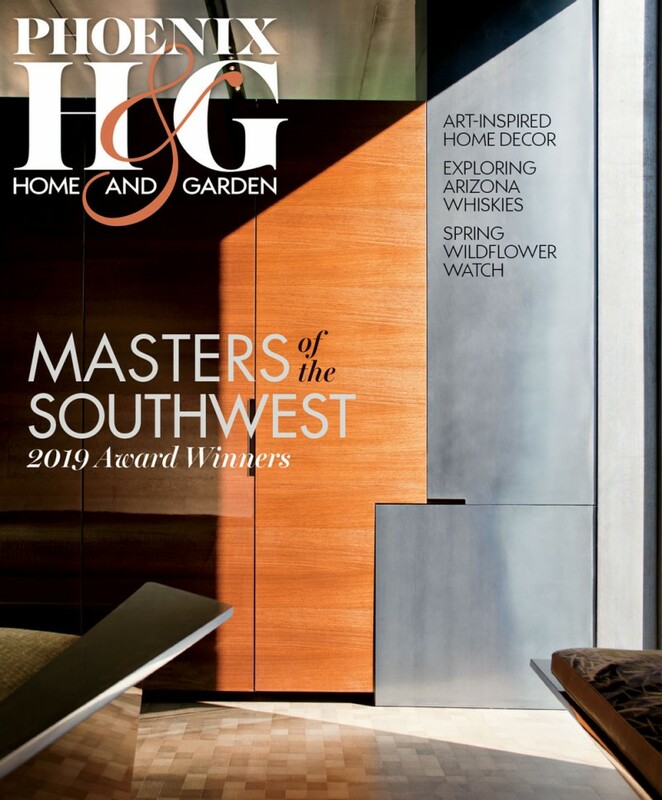 At the foot of the deck’s staircase is an imposing 4,000-pound armed Mexican giant cardon (Pachycereus pringlei) that’s the star of the entry courtyard. Nicknamed “Carlos the Cardon” by the Davises, the massive plant was brought in to replace a decaying tree; it’s so large that it had to be placed using a crane. 1. An intimate seating area is the perfect respite after practicing on the adjacent putting green. 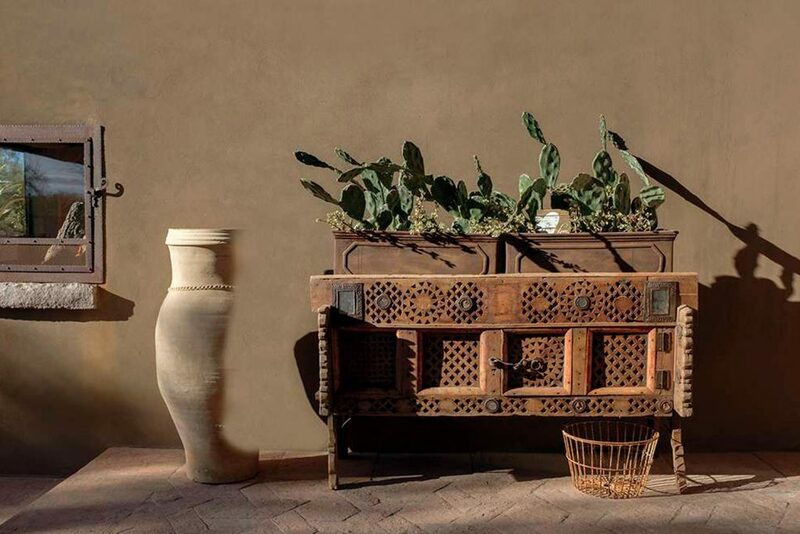 A rustic industrial cart doubles as a coffee table; it is topped with a potted spineless prickly pear. A rosemary hedge in the foreground was one of Taunya’s ideas. A Spanish Dagger yucca stands tall between the patio and the swimming pool. 2. Landscape designer Chad Norris added a variety of desert-friendly plants and cacti, including this showstopping cardon, in beds and pots to the setting. The stairway to the raised front porch is seen on the lower right, while a casual, covered outdoor dining area is seen on the left. “The space needed something tall, wide and sprawling that wouldn’t obstruct the view,” explains Norris. 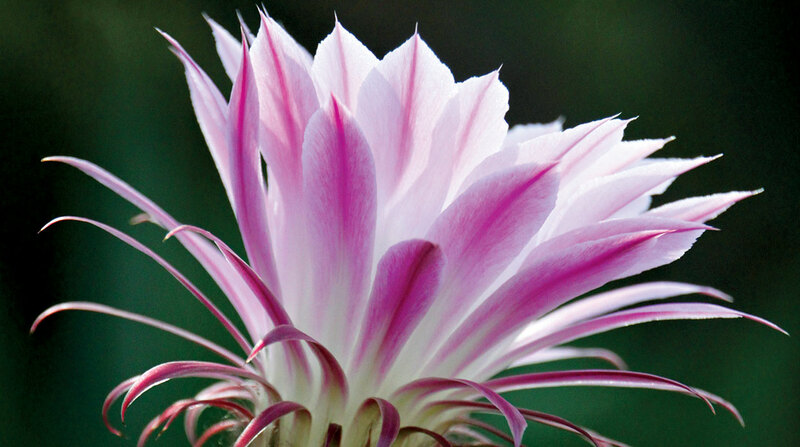 “When the Davises saw this cardon, they fell in love with it.” Unlike a saguaro, which is similar in appearance but blooms only at the tops of its stems and arms, cardons produce spring blossoms all over their bodies, resulting in a visually impactful vignette when viewed through the home’s large front window. 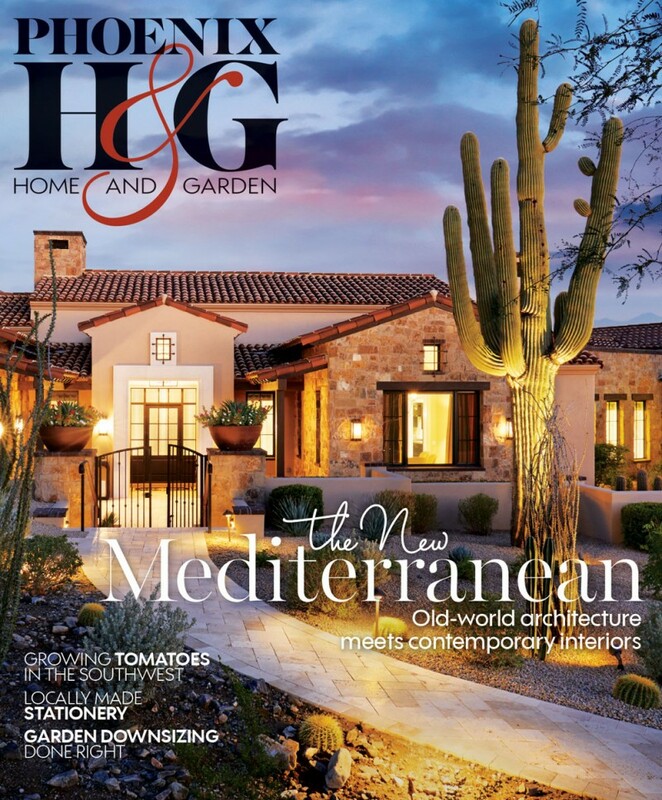 The central feature of the backyard is a covered outdoor living/dining room that is framed by beds filled with desert plants and pots overflowing with lush greenery. The space invites lounging, dining and sharing the spectacular sunsets framed by the trees in the distance. Light spills in from an atrium nestled between the covered patio and the house. 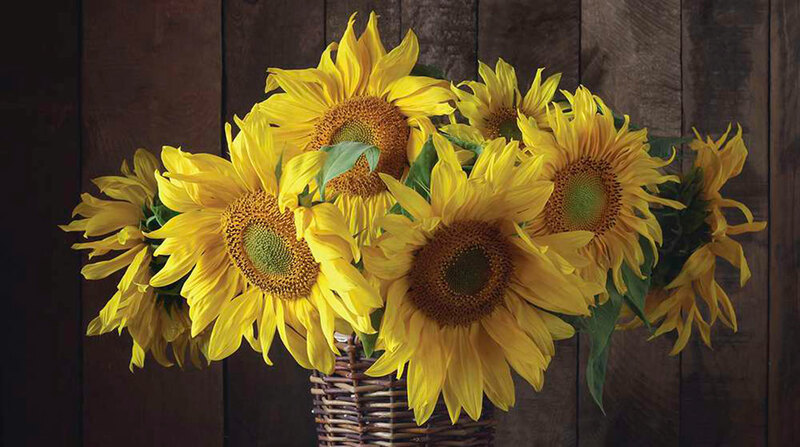 To create a relaxed yet polished feel, Taunya worked with interior designer Jacques Piquemal. The patio opens up to a mirror-edge pool that reflects the soaring desert sky; its cerulean waters complement the blue furnishings. All around are small potted plants bursting with color. Each pot was carefully chosen by Taunya; they’re filled with small cacti and succulents, blue chalksticks (Senecio serpens), sweet alyssum (Lobularia maritima), dusty miller (Senecio cineraria), geraniums and more. 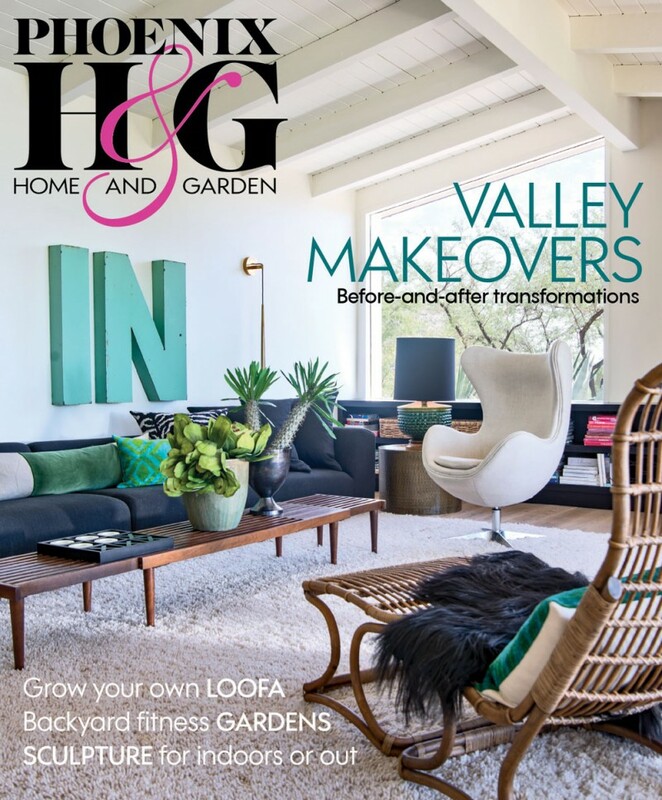 She and her husband are also avid golfers and lovers of all things sporty, so the couple had an area of the backyard leveled to create a putting green with a contemporary, rectangular shape. It is bordered with a stone pony wall and framed with grandiflora roses, another of Taunya’s selections. A horseshoe pit and bocce court add to the outdoor fun. “We are really happy with how everything turned out,” says Taunya. “The addition of the putting green really opened up our whole yard. We have a lot more useable space and the entire property has better balance now.” Listening to her enthusiasm, it’s clear that this restorative place with a bit of Western whimsy is the result of a purposeful vision. 1. An intricate teak dowry chest from India welcomes guests at the front entry. 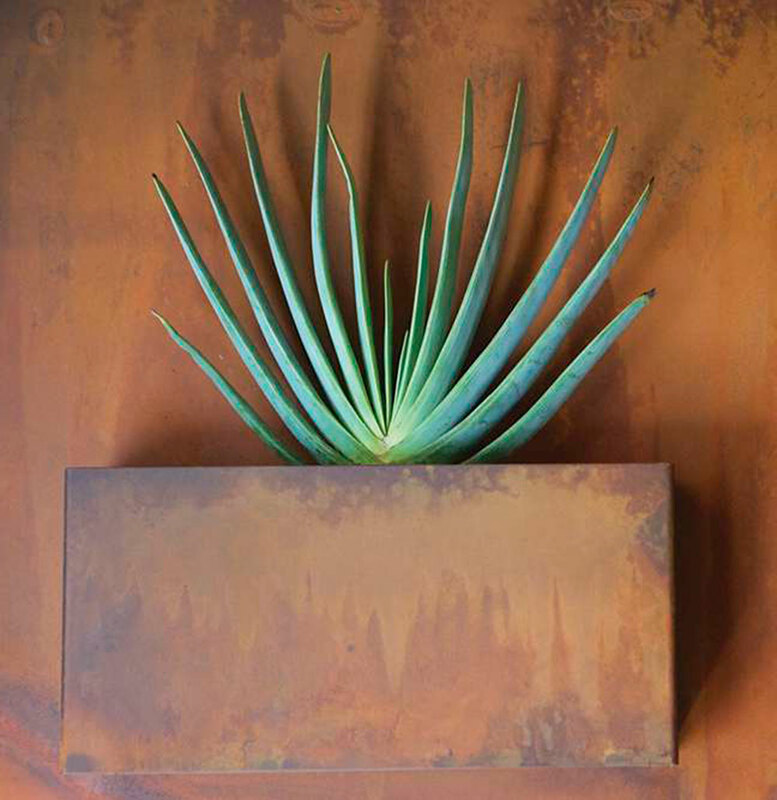 It holds weathered planter boxes filled with spineless prickly pear cacti (Optunia laevis). 2. 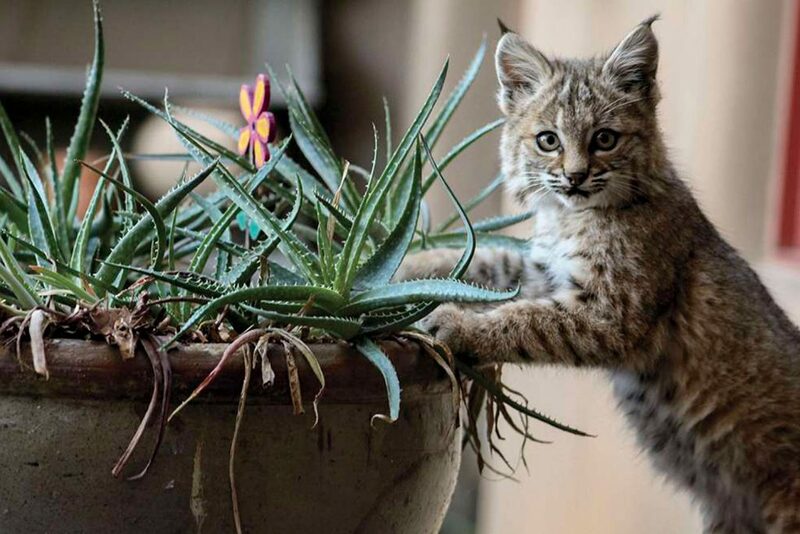 Taunya enjoys taking photos of the trio of bobcat kittens that have taken up residence on the property. Here, she captured one of the kittens exploring a potted plant. 3. The outdoor dining area is used year-round. From grilling dinner for two to hosting a gathering of friends on the rustic benches with bright zigzag-patterned pillows, the space offers a cozy vibe. 4. The courtyard features a welcoming built-in fireplace. “We light it every time we entertain because it warms the heart,” says Taunya. 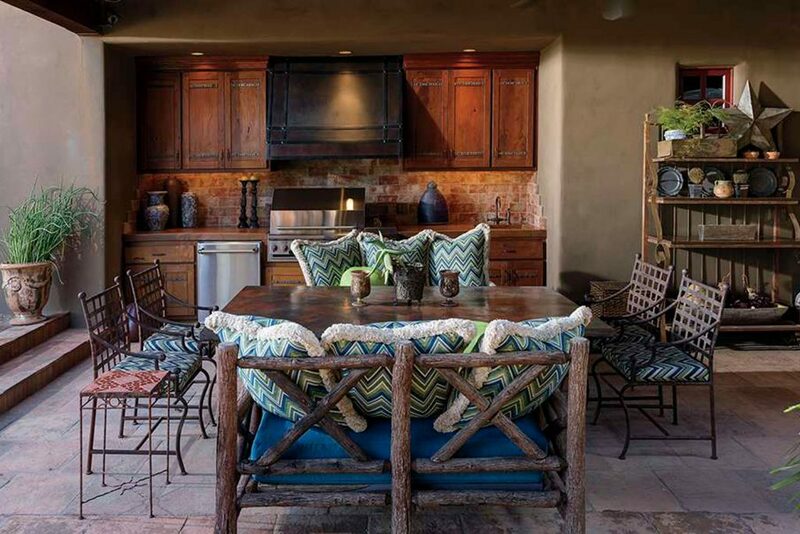 Interior designer Jacques Piquemal mixed beachy driftwood gray wicker furniture with a rustic Western lodge-style accent table and chairs to create a fireside conversational area.